We have been running a boutique hotel in Dalyan since 1997. All the experience gained over the years of hosting guests in the hotel helped us design, build and let out this precious “home”. If you’ve been to Dalyan before you are already in love with the place or if you haven’t been here before it’s only a matter of a visit. Dalyan is only 25 km from Dalaman Airport and we can arrange airport transfers at a small cost. 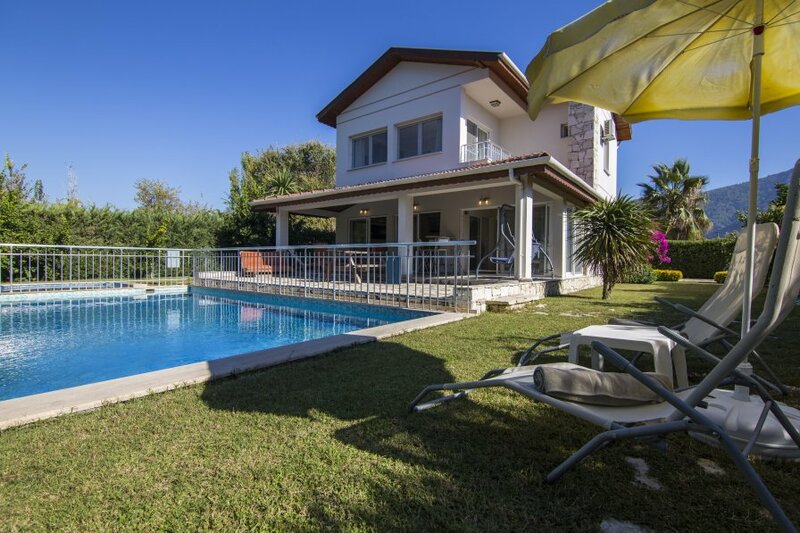 Villa Crescent is located in quiet part of Dalyan surrounded by private villas rather than hotels of any crowded accommodation although it’s only 8-9 minutes walk to the town centre. A big super market is only 4 minutes, walk from the villa. Villa has a spacious living room with dining area downstairs. The living room is furnished with high quality comfortable sitting set, 42” satellite TV with surround sound system & DVD player, free internet access. Living room opens up to the terrace and the swimming pool. The kitchen fully equipped modern kitchen with high quality finish opens to the terrace and fire place corner. Kitchen has conventional cooker and oven as well as a microwave. Also it’s equipped with a dishwasher. Kitchen is not there only to cook basics; it’s provided with all kinds of cutlery, cooking ware etc. There is also a WC and a utility room with washing machine, iron and ironing board downstairs. Upstairs consists of three bedrooms one of which is en-suite bedroom. The other two rooms share another bathroom. All rooms are air-conditioned and have balconies. There is a safebox in one of the bedrooms. Staircase has a small aluminium gate to isolate the stairs for the safety of little kids. All flooring material upstairs and stairs is iroko wood also known as African Teak. Dalyan is a pretty safe place however the villa is fitted with an alarm system and a safe box is provided. 2 bicycles are at the guests’ service free of charge. The villa is cleaned twice a week and bed linens and towels are replaced during cleaning. 2 sets of towels are provided per person for indoor and outdoor use. The house has UK type cable extensions to minimise the guests’ travel needs. Our hotel is located only 400m from the villa, We arrange some tours and activities for our hotel guests, we definitely won’t miss out our villa guests, they will be informed too. Terrace is probably our guests’ favourite place to spend time as it’s shaded with comfortable garden furniture, swing and a high table with stools. The private swimming pool is situated right in front of the terrace separated by an aluminium rail for safety, same as the children’s pool separated from the main pool. The pool which is cleaned everyday is surrounded by green grass and sun loungers. Garden is taken care of every other day. Passed the swimming pool is the barbecue area with a stationary barbecue, gazebo and hammocks. The swimming pool is maintained only during summer months (beginning of April till the end of October). Going back to Dalyan and the reasons we fell in love with the place; it still is a fishing town hence the name Dalyan – fish farm, being a conservation area, it’s never spoilt, very much like the day one we came here, caretta carettas, lake, river, sea, green, blue, history, ancient city, bars, great food & drinks, shopping and most importantly a peaceful town, anything you can ask for from your holiday. The sea is 20 minutes in public bus from Dalyan but we’d recommend the boat ride to the sea, a 35 minute enjoyable cruise amongst the reeds on a public boat. Dalyan as much as itself being a centre of attraction, there are numerous other tourist attractions close by such as Marmaris, Fethiye, Oludeniz, Koycegiz, Saklikent, Kayakoy and many more as well as many destinations by daily boat trips, Ekincik Bay, Bacardi Bay, 12 Islands. There is also a list of important and emergency contact numbers, a selection of our favourite restaurants and bars in the villa. Hommocks in the garden. Rock tombs visible from upstairs balcony. 2 nos bicycles dedicated to free.